TALK English School receives many international students who have started their ESL studies at other schools and then been convinced by some of our students whom they meet or just from looking for an alternative school on their own, have then enrolled at TALK. 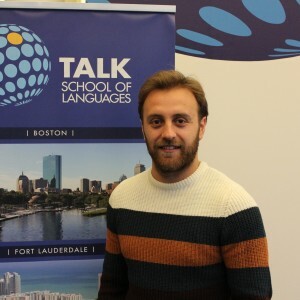 Ertugrul Turkseven is one such satisfied student who transferred to TALK Boston, and he talked about his experience here so far. My name is Ertugrul and I am from Turkey. I came to Boston 10 months ago but I was at a different school for 6 months. I couldn’t improve my skills with that school because of their teaching styles and stuff at the school was not good for the students. After that I decided to study at TALK Boston, and it was the best decision I made after I came to Boston. It is difficult to explain the school’s teachers, stuff and materials. First of all, you are going to feel like you are in your home and that is a very important thing, if you are to learn a second language in a foreign country. Teachers and staff are incredibly friendly persons. After your class, you can stay in the school and you can have lunch with them thus improving your English, because always, they fix your mistakes – by making a joke. If you have a question, it doesn’t matter what is your question about, you can ask them everytime even if they are busy. They have helpful informative characters. Those characteristics and features makes them real teachers. All my old friends from other countries came to TALK school with me and every month, we extend our classes over and over again.